Federal College of Education, FCE (Special), Oyo NCE admission list for the 2018/2019 academic session is out and now available online. Go to https://nceportal.fcesoyo.edu.ng/(S(k3gsayo3guk2g1upncsrqcgy))/UTMEAdmissionList.aspx to check your FCE (Special) admission status for the 2018/2019 academic session. 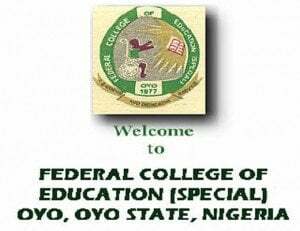 RECOMMENDED: Federal College of Education (Special) Oyo NCE Admission Acceptance Fee Payment 2018/2019. Please I wish to know a list of courses the school offers and what qualifications are being awarded to students. Also I need to know the school fees. PLS,MY DAUGHTER WAS AMONG THE FRESHER BUT WE HEARD THAT THEY HAVE STARTED(ICT) TRAINING.BUT THE SCHL. IS STILL ON STRIKE.I WISH TO KNOW PLS.